It is important to note that the "new PRO" accounts with v4 are not the same as the "current PRO" accounts. We are discontinuing our Standard licenses completely with this new release, so the migration to the v4 with this license is not possible. Furthermore, migration of Sub-Account is not possible, since this account is not purchased directly from us. All vooPlayer v3 users (with the exception of those with a current PRO account paying a recurring fee) will be transitioned to the NEW vooPlayer PRO accounts. All current vooPlayer users with the PRO accounts paying a recurring fee, will be transitioned to the ENTERPRISE license. Standard licenses and Sub-Accounts can't be migrated, so if you would like to take advantage of our new features, you should obtain a new vooPlayer v4 Enterprise license on a monthly or a yearly payment plan. Kindly note that there is no option to add a new video from the v3 interface since it is no longer supported, however, you can continue using the old version and all your previously uploaded videos will still work. The PRO or the ENTERPRISE license (depends on your v3 license) will be automatically allocated to your account, free of charge. 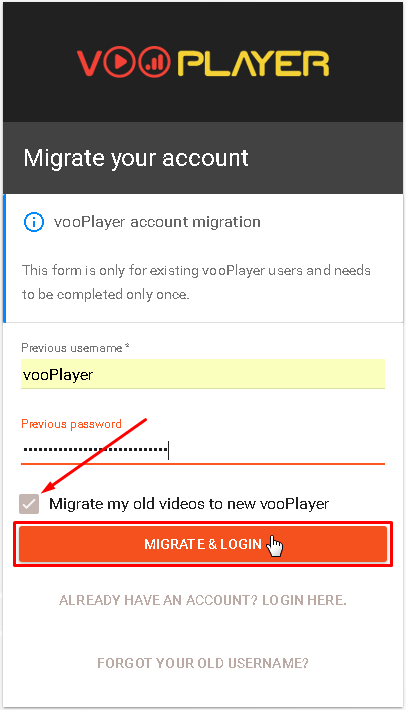 All your videos will be copied to the new version if you check the option "Migrate my old videos to new vooPlayer" or you can transfer them later via MASS IMPORT option. 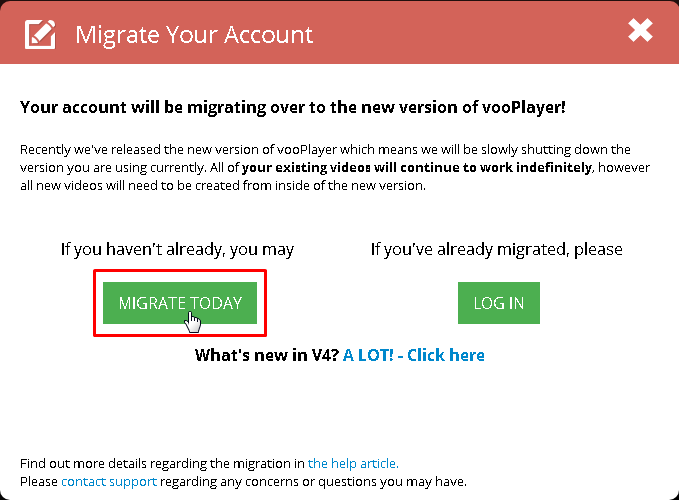 Another option is to log in to your v3 account and click to add a NEW VIDEO, a pop-up window will notify you about the new version and the migration process. If you click MIGRATE TODAY, you will be redirected to the Migration Page. We have prepared special discount for all our faithful users (one-time offer) for the ENTERPRISE license that you will receive after the migration process. You might be interested to know that you can switch to the ENTERPRISE license any time and revert to PRO as well, here are the differences between them. If you have any questions or concerns regarding your account, license, or how this will affect you, please contact our support team.